I just got back from my latest journey, this time to the mega destination: Peru. Seeing that undertaking a food adventure was the main reason for my travels, I think it’s most appropriate that I start my Peruvian reflections with the country’s source of gastronomic pride. 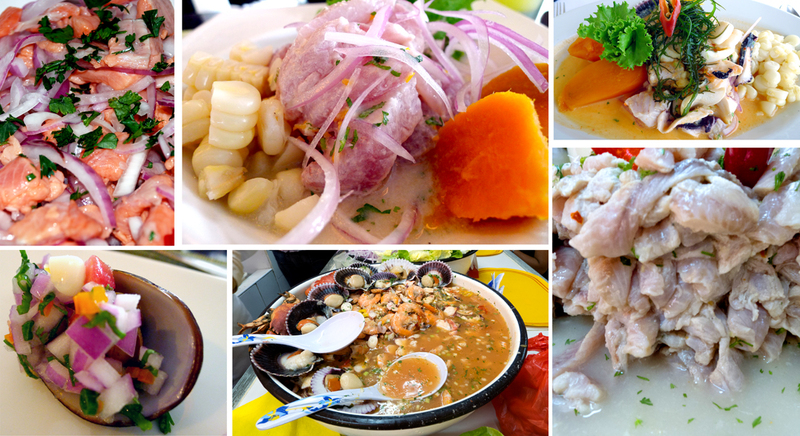 In a country where food rules, ceviche is king. With the abundance of seafood found off the capital city’s coast and in the country’s numerous lakes, it’s no wonder this fresh fish dish has taken Peru by storm. Ever so popular among the locals, ceviche has even had a holiday declared in its’ honor. The dish is a relatively simple one. Hunks of fresh raw fish and shellfish marinate quickly in a mixture of citrus (in Peru, lime) and seasonings such as salt, cilantro, red onion and chillies. Along Peru’s coast, Corvina and Lenguado (bass and sole respectively) are the most common fish used in the classic version. Inland, Trucha (trout) is the major player. Scallops, mussels and shrimp are commonly found in the mixto varieties. Once the cooking by acid has begun, the seafood mixture is scooped up and served, typically with corn and a side of potato. The liquid runoff is poured over the plate. Those wanting a real wake-me-up scoop up the liquid, called leche de tigre, and drink it along with their meal. Needless to say, ceviche was as popular with me as it is with Peruvian nationals. This last week has afforded me the chance to have many delicious renditions of the fish mixture. Below, the highlights in photo collage. Place the sliced onion in a bowl of warm water, let stand 10 minutes, then drain. Meanwhile, place fish in a non-reactive bowl and rinse gently. Season with salt, onion and the chili pepper. Toss fish preparation in lime juice and mix well. Let for 5 minutes or until the fish begins to turn white. Sprinkle with cilantro and serve. ← just because: miss me?